Face-to-face contact remains one of the most effective methods for gathering information, but it’s all too easy to get it wrong. We ask the wrong questions, treat it as an informal chat, create a bad impression and lose credibility. An interview needs planning and a clear picture of what the interview objectives are. In this extract from our Requirements Gathering & Specification workshop we’ll look at some proven tips and techniques for ensuring a successful information gathering interview, whatever the title or position of the person being interviewed. As mentioned, an interview is not an unplanned discussion or an informal chat, although it needs elements of both to be successful. You, the interviewer, are seeking information from a stakeholder, client, user or other person who is directly affected by the project you are working on. As such you will need to plan out the topics you want to cover, yet allow flexibility to explore new areas. The person being interviewed (the interviewee) must feel they have been given a fair hearing and not interrogated. Think of an interview as having three phases – the preparation you do beforehand, how you conduct the interview itself and then the follow up. We’ll look at all of these shortly. A word on personalities – often you will be interviewing people who have vastly more knowledge of their business area than you. How do you convince them that an interview with you is worth their time? How often have you heard the expression I’m not wasting my time teaching you about MY business? Keep in mind that your speciality is business analysis and not knowledge of their business. Your job is to help them solve a business problem or take advantage of an opportunity. If they were any good at business analysis they might be able to do this themselves but until this happens, they need you. Explaining this diplomatically however is a skill only learned with practice!! All interviews are different, but every successful one involves preparation. First, what do you want to achieve at the interview – what are your objectives? If it’s the first interview on a new project then your objective should be to establish the Terms of Reference (also called a Project Charter or Project Brief). Typically this includes a concise statement of what the problem or opportunity is, together with a description of what your client wants to achieve. Focus on the what not the how. Note that objectives can be tested by seeing if they solve the problem. For a Terms of Reference you will also need to establish the scope of the project (this department but not that one) together with constraints (e.g. time, money). In this first interview you’ll also be looking for likely savings and benefits (at a high level) and to identify the project sponsor and stakeholders/users. In subsequent interviews you’ll be looking for more details and your objectives may well cover topics such as business functionality – what the proposed solution needs to do (functional requirements) as well as performance and implementation considerations (nonfunctional requirements). Just don’t try to cover too much in each interview. Be realistic in setting objectives based on the time constraints of the person being interviewed. Naturally you’ll have reviewed any available documentation as part of your preparation. There may be annual reports or operational reviews which will provide background information. The first interview could be the result of a written request from your client outlining their needs. Discuss this with your team but be careful of thinking up potential solutions. The most important objective of the first meeting is to establish, and gain agreement, as to exactly what the problem or opportunity is. Not everyone can explain clearly and unambiguously what their needs are – this is where you come in. You’ll need a guide, a checklist, of all the points you want to cover in the meeting. No one can remember everything that needs to be asked – a checklist demonstrates preparation and professionalism. Make a list of all the topics you want to cover (don’t sequence them yet), then for each topic list the information you want to obtain. A little research on the person to be interviewed – their role and responsibilities –will help in keeping your information gathering relevant. Once you’ve done this you can sequence the topics and sequence the questions within the topics. 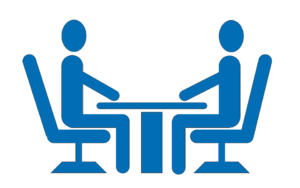 Look for a sequence of topics that will allow the interview to flow – just like a conversation. In the following example (the first interview with a business manager) we’ve started with questions which will establish background facts and data before moving on to the meat of the interview – the business requirements. If you know a lot of the background data already and just want to verify a few points, then say so. This shows that you’ve done your homework. In this example we’ve deliberately avoided writing out the questions in detail. How the questions are asked, and the wording used, will have a major impact on the success of the interview. We’ll be covering this shortly. It may be appropriate to send an agenda before the meeting. If you do, avoid sending the complete checklist, they may be tempted to have someone else answer your “routine” questions. 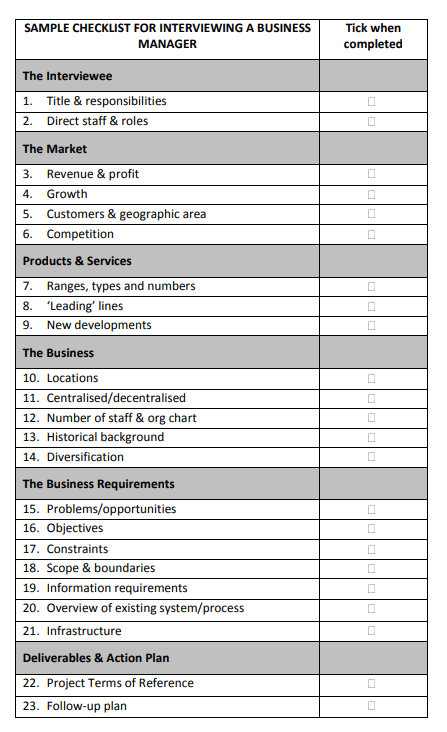 Keep the agenda you send brief – just the most important topic, the business requirements. As for the “routine” questions, you want to hear the answers in the interviewee’s own words. How long should an interview run – how much information can you take in at a time? When it comes to meetings, most people work in one hour increments but if they’re running late or have another meeting to go to afterwards the one hour can easily shrink to 45 minutes. Ask for an hour and a half but aim to finish in one. Then if you do overrun you’ve got some contingency time – and if you finish early it will be appreciated. During the interview, nothing’s worse than running out of time before you’ve got through all of your important questions. In the example interview guide above, don’t spend more than about 15 minutes on the background data. You can always return to this at a later time. Allow yourself 5-10 minutes at the end of the interview to summarise and agree the next steps. The majority of the interview time should be spent on the most important topics. Before the interview try a walkthrough of your interview guide. How long will each section realistically take? Do you need to drop some of the fact finding questions or find out the information in a different way? The first few interviews you conduct on your own will always be nerve racking – where do I start, how do I avoid wasting time, how do I maintain credibility? Overcoming these hurdles is a mixture of preparation and experience. Focus on your objectives – what you want out of the interview – but keep in mind that it’s a two-way discussion between individuals. The interviewee will also want to get some key points across to you. Don’t write things down word for word – sometimes keywords and phrases are sufficient memory joggers as you should review your notes straight after the interview while it’s still fresh in your mind. Try writing without looking at your notepad – deceptively easy once you’ve tried it a few times. Practice while watching the TV news. It doesn’t matter that it’s not particularly neat, as long as you can understand it. Use blank paper – some people like to prepare a form (e.g. a table) with questions in one column and space for answers in a second column. But what happens when you run out of space – pretty soon your notes are all over the place. Notice how the questions in the interview guide are numbered. Just use the numbers as headings and write as little or as much as you need. Mind mapping – popularised by Tony Buzan, mind maps provide another way of writing down keywords. They can help both in taking notes and, later, in making sense of your notes by showing the flow of the meeting and its outcomes. 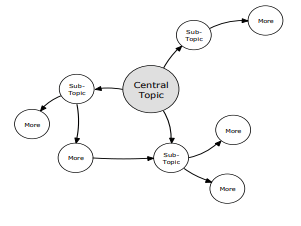 There is no right or wrong way to draw a mind map. If you’re using a note book, it’s a good idea to use the unlined side of the page (lines can be distracting) and to keep the paper in landscape mode (we tend to draw horizontal oval shapes because it helps to write in the words). We are after speed not neatness. Recording devices – great in theory but off-putting for many people. Even if the interviewee agrees, you may find they are guarded in what they say. Interviews are often arranged by others so it never hurts to introduce yourself, your role and the agenda. If it’s the first interview (as in the previous interview guide example) tell the interviewee you want to check the background facts first, before covering the business requirements. At the end of the interview you’d like to agree the action plan with them. As mentioned, it’s vital that the various topics are covered in a logical sequence. Information acquired in a disjointed manner is confusing and often misunderstood. Badly structured interviews cover the same ground several times and become exhausting as both user and analyst struggle for understanding. How you ask your questions and the wording you use are at the heart of any interview. Direct questions using simple phrasing work best. It’s not for nothing that the words what, why, when, how, where, who form the basis of police investigations, research projects and newspaper reporting. Use open questions when you don’t know much about the topic – could you explain to me how…, what are the key issues that you face? Use closed questions (yes/no answers) to pin down the detail. Try to use a conversational style to your language, you’re after a natural dialogue, not interrogation by the numbers. Ask for clarification if you’ve not understood something. You can restate key points in your own words or repeat a word they’ve just said (a noun works best) as a question. This creates a natural pause in the conversation without appearing to be rude. It shows you’re listening but seeking clarification. Don’t take everything that’s said at face value. You may need to ask other people to verify the information or ask the question again, but in another way. After the interview you’ll also be able to ‘work’ the information, to see how it fits with other data and calculations. When information is varied and opinionated you will need to be diplomatic. Be careful not to infer that you’ve been led up the garden path by someone. Rather – I’m a bit confused about … perhaps you could clarify it for me? When you believe that information is incorrect there is another possibility – you have misunderstood the answers. Perhaps your questions were ambiguous? You can ask a question in another way to check understanding, and of course you can ask others. If the answers don’t make sense, then something is wrong. Repeating your understanding in your own words to as many people as possible is a good test. Eventually you’ll be formally writing it down and probably presenting it to an audience and then you’ll be checking it again – but by this stage you’ll want to be confident that you’ve got it right. Expect questions from the interviewee as well. It would be unrealistic of them to ask for your thoughts on a solution straight away – and risky for you to offer one – but they may ask how you will you use the information you’re gathering? Make sure you’re clear on why you’re asking each question, how you will use the information and be prepared to explain it. During a first interview you’ll usually be focused on information gathering, rather than interpreting what’s said. As you get into more and more detail about how the current system or process operates (usually in subsequent interviews) you’ll find there are always exceptions to the stated business rules and procedures. Anticipate that some will always exist but don’t make decisions on how they should be handled – you are merely identifying them. Listen for clue words which can alert you to exceptions – mostly…usually…normally…sometimes. You can also prompt for exceptions by asking direct questions such as – do you ever have a situation where….? The interviewee may make statements like we expect turnover to increase by 17% without explaining how. This might be achieved by increasing prices, by more sales or by expansion into other markets. Knowing the how will be helpful to you. You’ll need to be flexible and allow for supplementary questions if the interviewee raises new ideas or topics you haven’t considered. Keep an eye on timing though as you don’t want to get sidetracked. Some people have a very clear idea of their requirements, others may be stuck in the past. Or they may not be able to explain what they need in a way they think you’ll understand. Try asking them to dream up what they would like to see happen if they had some magic wand available to make it come to pass. Often a totally new way of thinking can emerge and you may just be the catalyst. It’s difficult to be cool, calm and collected all the time. Staying objective is hard and emotions can often take over, particularly if there’s a difference of personalities. Just stay focused on the job at hand and avoid arguing, criticising, lecturing or appearing superior. If the interview still goes badly then, unfortunately, you may have come up against a difficult character. This does happen and talking it through with your manager or a colleague can give you some fresh ideas for tackling the problem. Hopefully you will have completed all your questions and clarified any issues you were uncertain about. However, if you’ve run out of time, set up another appointment now. If you need to conduct more interviews with junior staff, ask for permission. Every interview should have a deliverable, whether it’s a formal document, minutes of what was discussed or just a verbal report. Agree what this will be before you leave and tell the person what your next steps are. If someone has given you an hour of their time, let them know it’s appreciated. A manager or executive will have a very clear idea of what they expect from you but someone at the operational level (e.g. a user of the current system) may feel that their views are not important. Telling them how their input will be used is a lot more rewarding than a brief thankyou as you make your exit. Have you achieved your objectives? You’ll need to consolidate your notes and analyse the information before you can answer this question. If you’re preparing a document such as a Terms of Reference, start fleshing out the headings. This will help you to identify any information that’s still missing. If you think you’ve succeeded and are ready to publish your Terms of Reference then send it as a draft to the interviewee. This allows them the opportunity to correct any mistakes or assumptions you’ve made and gives them a sense of ownership. Take some time to review your own performance. What worked well, what could you have done better? Go through your interview guide to see how relevant or useful each of the questions was. In your career as a business analyst you’ll be working on many different projects but how you communicate with people stays very consistent. The checklists and guides that you develop can be used many times over so it’s always worth fine tuning them. A final word – keep in mind that during an interview you want the interviewee to talk as much as possible. The interview is about them, not you. Some of the best TV interviewers – Michael Parkinson, Andrew Denton for example – succeed because they bring no ego to the interview. They’re not trying to make a point or demonstrate their skills. It’s all about the person sitting opposite them. Article last updated 30th April 2018. Learn more about interviews and practise interview scenarios on our Requirements Gathering & Specification workshop.